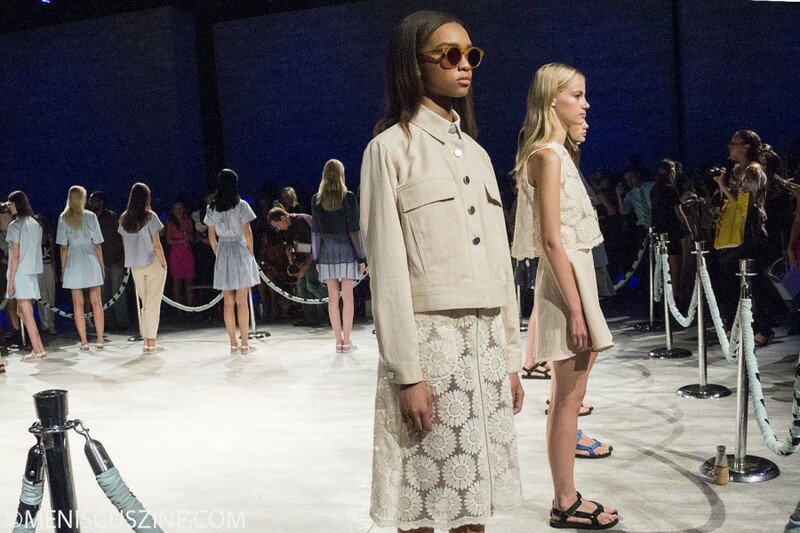 Charlotte Ronson Spring 2015: Why reinvent the wheel? In an easily digestible Spring 2015 collection consisting of 20 looks, Charlotte Ronson continues the trends we have been seeing for the past year. Why reinvent the wheel if you can simply make it in different colors and materials? Sweet crop top silhouettes, sheer paneling and lace, and ubiquitous Teva sandals all made an appearance at her presentation. The overall feel of the collection brought to mind a young girl enjoying a carefree California afternoon, an image reinforced by the navy blue floral spaghetti-strap sundress and sheer daisy crop top worn over a strapless cream mini dress. 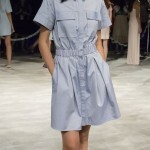 There were some sporty deviations that spoke more to the sandals worn by all the models, such as a basic white floor-length waffle knit tank dress and a sky blue leather jacket with oversize pockets and pointed collar. One notable look was a navy blue perforated scuba sweatshirt with sheer paneling halfway down the sleeves and bodice, worn with a light blue side-pleated oxford skirt, that had “blogger” written all over it.